Middle School matters. These momentous years in a young person’s life mark the time when he or she transitions from childhood into youth. Essential experiences shape a young person in how he or she sees themselves and the world and they equip him or her to flourish in that world. At SSCA, our Middle School program is designed to challenge developing minds within a caring environment. 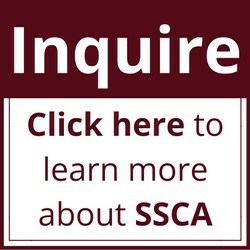 In addition to the core classes of Math, English, Lab Science, History, and Bible, the SSCA Middle School student will take classes in Latin (2 years), Robotics and Coding, Theatre Appreciation, Public Speaking and Debate, P.E. and Health, Art, and Study Skills. Middle School faculty integrates faith and character into school life. As students develop their social identity, our faculty engages them individually and as a class in what it means to live a life that values others and honors God. Each subject, not just Bible class, integrates Micah 6:8 into its course design, demonstrating that every aspect of learning connects with justice, mercy, and humility.